Bitwise Asset Management, creator of the world’s first privately-offered cryptocurrency index fund, the Bitwise HOLD 10 Private Index Fund, today announced the filing of the registration statement for a new fund, the first publicly-offered cryptocurrency index exchange-traded fund (ETF). The new ETF will be called the Bitwise HOLD 10 Cryptocurrency Index Fund. It aims to track the returns of Bitwise’s HOLD 10 Index, a market-cap-weighted index of the 10 largest cryptocurrencies, rebalanced monthly. The HOLD 10 Index captures approximately 80% of the total market capitalization of the cryptocurrency market. It uses a 5-year-diluted market cap and other eligibility criteria meant to address challenges of the crypto space such as continuously changing supply, liquidity, trade volume concentration, and custody limitations. A registration statement relating to the shares of the Bitwise HOLD 10 Cryptocurrency Index Fund ETF has been filed with the Securities and Exchange Commission (SEC) but has not yet been declared effective. The shares of the ETF may not be sold nor may offers to buy be accepted prior to the time the registration statement becomes effective. This press release is not an offer to sell or the solicitation of an offer to buy shares of the fund, nor will there be any sale of the shares in any state or jurisdiction in which such offer, solicitation, or sale would be unlawful prior to registration or qualification under the securities laws of any such state or jurisdiction. An offering of the shares of the Bitwise HOLD 10 Cryptocurrency Index Fund ETF will be made only by means of a prospectus. Founded in 2017, Bitwise Asset Management is a cryptocurrency asset manager. Bitwise launched the first cryptocurrency index fund, the Bitwise HOLD 10 Private Index Fund, on November 22, 2017. The fund is an open-ended private placement vehicle that is open to accredited investors and offers weekly liquidity. It tracks the same index as the proposed publicly-offered ETF. Bitwise is backed by leading institutional and individual investors, including Khosla Ventures, General Catalyst, Blockchain Capital, Naval Ravikant, Alison Davis, David Sacks, Elad Gil, Adam Nash, Adam Ludwin, Suna Said, and Avichal Garg. The firm is a partner to individuals, financial advisors, family offices, investment managers, and institutions in navigating cryptocurrency. The team behind Bitwise, which includes several veterans of the ETF industry, has expertise in technology, security, indexing, and asset management , and is headquartered in San Francisco. Bitwise Index Services, LLC is a subsidiary of Bitwise Asset Management. Bitwise Index Services develops cryptocurrency indexes and conducts research in the area of cryptocurrency investing. 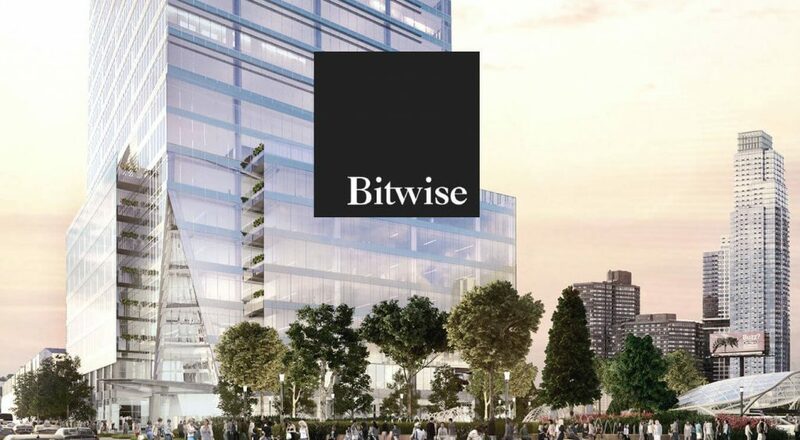 Bitwise Investment Advisors, LLC, a subsidiary of Bitwise Asset Management, sponsors U.S. and non-U.S. private funds that invest in cryptocurrencies. This release (this “Release”) is being furnished for informational purposes only. Performance of an index such as the HOLD 10 Index is not illustrative of any particular investment. It is not possible to invest directly in an index. Exposure to an asset class represented by an index may be available through investable instruments based on that index. There can be no assurance that investment in cryptocurrencies based on the index will accurately track index performance or provide positive investment returns. The Bitwise HOLD 10 Private Index Fund, Ltd. may be offered to certain United States-accredited investors as defined in Rule 501 of Regulation D promulgated under the U.S. Securities Act of 1933 and certain non-United States persons pursuant to Regulation S promulgated under the Securities Act of 1933. This is neither an offer to sell nor a solicitation for an offer to buy Shares in the Fund. Any offer to sell or solicitation of an offer to buy Shares will be made solely through definitive offering documents, identified as such, in respect of the Fund in compliance with the terms of applicable securities and other laws. Such definitive offering documents, if any, will describe risks related to an investment in the Fund (including loss of the entire investment) and will qualify in their entirety the information set forth in this Release.